What the Buffett Indicator is telling us is that stocks are insanely overvalued right now relative to the growth of the economy. I believe the markets are overvalued. Let me start with some background so that you will understand where I’m coming from. Wall Street originally began operations in the 18th century as a place for businesses to raise capital in order to expand and grow operations. But what most investors don’t know is that after a company does its Initial Public Offering (IPO) and raises capital, it has almost zero control over its shares as those shares are now in the public domain and in the hands of investors. What happens to the future of those shares depends on how investors feel about the future prospects of the company. In most cases when the company is doing well on Main Street then its shares in the public domain usually go up, as investors feel good about the company’s prospects and buy them. So investing for most people is a direct result of emotion or how they “FEEL” about a certain company or its products or services. Thus when we invest in a stock our success or failure is determined firstly by how well management runs the firm and secondly on how our fellow investors react to how well management does. Going in, we understand this phenomenon and this is the cornerstone of capitalism. This is what’s called the free market. Back in 2007 I noticed that companies were extremely overvalued and positioned my friends and family mostly in a cash position. I also did the same thing in 1989 and 2000 prior to what I believed were recessions, which soon showed up. Luck or skill (you decide), I was right in doing so because in 2008 all hell broke loose and from the highs in 2007 to the lows of 2009 the stock market went down -59%. The markets should have been allowed to go down further as the banks and financial institutions or “Den of Thieves”, which caused the mess through their corruption, should have been allowed to fail. But governments from all over the world stepped in through their Treasury Departments and Central Banks and halted the fall of the markets. In doing so, the financial institutions that caused the collapse were bailed out. Now going into 2016, banks like JPMorgan, Bank of America/Merrill Lynch and Citigroup and others had their mistakes and corruption wiped out by the central bankers of the world. The problem is the central bank balance sheet look like this. Your eyes are not deceiving you, as the central bankers of the world have printed 10 times the money that they had in 1995. Even worse, many central bankers are still printing at insane levels today. Not only did they print all this money up, but also created an element of bad behavior as they dropped interest rates down to zero percent. I’m not afraid to call it what it is – bad behavior. GDP did grow, but only because debt grew by a whopping $185 Trillion. 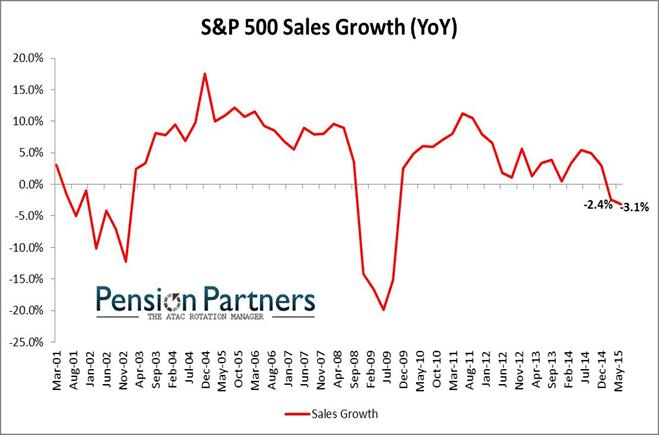 When you look at the revenue of the S&P 500 Index components, the revenues have not grown much in comparison. This is because companies are not borrowing money to expand operations, but in most cases are doing so to buy back stock. When we see that there is no growth, the only logical conclusion is that stock prices are being artificially manipulated by CEO’s taking on excessive debt. They do so because their personal stock options are based on stock appreciation instead of revenue growth. As a result this is what is happening. 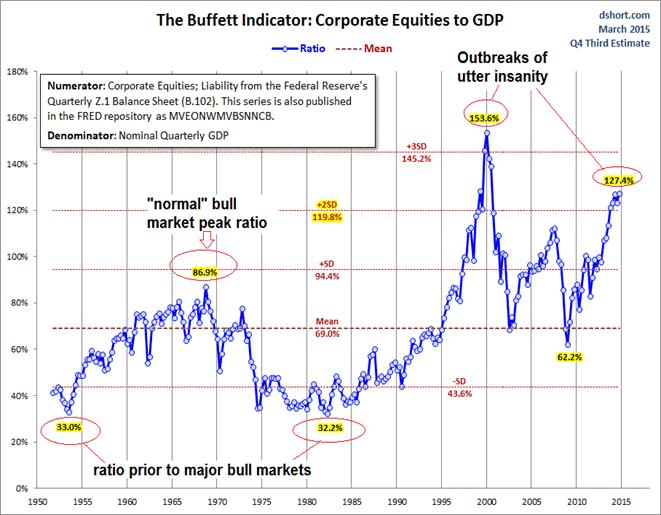 What the Buffett Indicator is signalling is that stocks are insanely overvalued right now relative to the growth of the economy. Logically, ask yourself, how is possible for stocks to go up in price when the companies are not investing in the growth of operations? The concept is exactly the same as the one used in the US Welfare system. How is it possible that every cash register line is 20 deep at a Wal-Mart on the day that welfare checks go out? The entire store is packed with customers because those shopping have gotten their welfare checks from the government and thus are using those checks to buy consumables. When corporate CEO’s borrow $trillions of dollars at near zero interest rates and then use that money to buy back stock, it’s the same concept. Everyone wins expect when the bill eventually comes due. The US Government has $19 Trillion in debt. The 500 components of the S&P 500 have $5.6 Trillion worth of debt, that will eventually come due at much higher interest rates. When you figure that most of this debt was used to buy back stock along with most of these companies cash flow, you can see why the markets went up and the S&P 500 Index is now worth $19 trillion. The great majority of Wall Street’s value is based on borrowed money. Now if any of you have ever taken on a lot of credit card debt, you know that someday it needs to be paid back and could cause serious problems if rates were to suddenly rise. So with all this debt on corporate balance sheets many of these companies are living on borrowed time. The October 9th, 1967 letter stated that personal considerations were the most important factor among those causing me to modify our objectives…publishing a regular record and assuming responsibility for management of what amounts to virtually 100% of the net worth of many partners, I will never be able to put sustained effort into any non-BPL activity. Therefore, before year end. I intend to give all limited partners the required formal notice of my intention to retire… — Warren Buffett May 29th, 1969 letter to partners. He then followed through and cashed out his funds and put his own money into Berkshire Hathaway and left the Hedge Fund business. If you look at the chart above, the numbers he was viewing at the time made him very nervous and were just above the mean. Not two standard deviations above the mean like we are now. The Buffett Indicator is now more than 50% higher then when he closed up shop. You can see why I as a Buffettologist in 2012-2103 started getting very nervous when we broke above 100% and am even more so now that we are at 127%. Capital preservation is thus paramount over capital appreciation as bad tiding seem to be just off the horizon. Friedrich was created as a way to give each company analyzed, a diagnosis similar to what a patient would receive at the doctors office. Thus I created the following ratios (found in the table below) to act as a yearly medical exam for each company. Here’s the data table for Apple of the custom ratios that I follow and meticulously update. Laying out the data like this and keeping on top of what the company is doing helps my portfolio to remain objective and to seek the best stocks for long term safety. With Friedrich we can therefore test 1000’s of companies and thus only pick those that have elite results. If we are also able to find elite results over a 10 year period, then we can expect good things to happen in the future, simply because we have identified an elite company with elite management at its helm, as such consistency of elite performance would not have been possible if there were not a strong corporate culture in place at the firm. Thus when I produce a Friedrich Research Investment Survey like I did for APPLE, I am simply doing what any Doctor would do for a patient as part of a medical check up. Since I am only looking for 50 investments out of the 1,000’s or so surveys that I will produce each year, I can afford to wait for only the best of the best to show up. By doing so, I am not investing outside of my boundaries simply to keep up with the market or the “Joneses”. Peter George Psaras is CEO at Conservative Equity Investment Advisors, a registered investment advisor based in New York. He is also the creator of Ask Friedrich, a unique blend of algorithms to analyze stocks focusing on free cash flow.